While walking east along the south side of Bloor Street in mid-town Toronto with my colleague Bob, I saw something quite unusual. Hovering above a large wooden table on the sidewalk in front of William Ashley’s store at 55 Bloor Street West was a full sized Indy race car. I don’t know a lot about racing, but I do know that cars and their tires are supposed to be on the road, so I was intrigued. On closer inspection, I discovered the 1,400 pound replica car wasn’t hovering but was sitting on four delicate looking bone china tea cups, one under each tire. The tea cups themselves were part of an elegant table setting featuring William Ashley’s finest. A little online snooping uncovered that William Ashley launched the display in 2011, 25 days before the 25th anniversary of the Honda Indy race in Toronto. 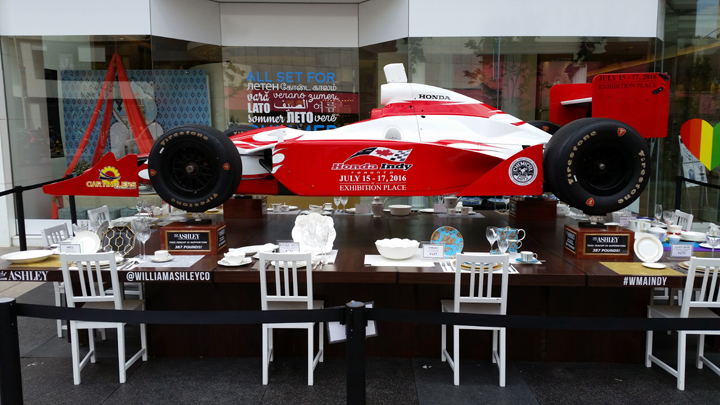 The race organizers had approached William Ashley, a long-time sponsor of Toronto’s annual Indy race, with this outdoor display idea to jointly promote the race and the store, along with the superior strength, durability and performance of bone china. Without flinching, I replied with my favourite answer, “It depends”. Since I didn’t know William Ashley’s actual planned objectives for creating this display, I couldn’t know exactly how to measure whether or not it worked. Objective #1: Create a unique and interesting event to generate press coverage. Measurement #1: In its simplest form, this is a matter of tracking the number of impressions through the various stories and mentions about their launch event through various print, broadcast, digital and social media. Objective #2: Communicate the key attributes of bone china. Measurement #2: While the first objective relates to how much coverage, this one relates to more important issues, such as the quality, accuracy and tone of the coverage. It could get into things like media monitoring, text analytics and sentiment analysis of the various forms of coverage. You could supplement that with before and after surveys and by intercepting people on the street to see if they saw the display and understood the message. Objective #3: Increase store traffic. Measurement #3: Count the customers, of course, but you need to compare the count to something, like how many customers they normally get on Wednesdays in June, or when they’ve created similar displays previously. Objective #4: Increase bone china sales. Measurement #4: It’s easy enough to add up the sales, but it would be helpful to compare the total to an average, or baseline, as with the store traffic example. You’d also have to decide how long that display might affect bone china sales. Seeing that display made me think (and write) about the superior strength, durability and performance of William Ashley’s bone china, and maybe now you’re starting to think about it. I’m not in the market for bone china right now, but maybe in the future and perhaps you will be too! The key lesson in all of this is that you need to set clear measurable objectives when planning your marketing in order to know what to measure and learn whether you’ve succeeded. In other words, measurement should be directly linked to your planning process. Defining how you will assess whether a marketing program is successful should be an integral part of planning. Good objectives will define the metric(s) that will be used to measure success, and the specific numerical outcome you want to achieve. For example, it can be a percentage change from a comparable period, or a specific outcome that you’ve determined would be worthwhile relative to the cost of the program. My four speculated objectives above were purposely vague to highlight the challenges presented by the lack of clarity. When you set your objectives, be very clear about the outcome you’re looking for. Here’s a better version of Objective #4: “Increase bone china (all brands) sales for June and July by 20% vs. June and July of last year”. That, you can measure. Without proper objectives, how or what to measure becomes an exercise in guessing, much like Bob and I had to do. To take the guesswork out of your marketing measurement, it needs to begin as part of your planning process. That’s where the rubber hits the road. Are you a short-term thinker or a long-term thinker? Both? Neither? Maybe you’d like to think about it and get back to me? Well, today’s post has a little something for both of you, or all of you. 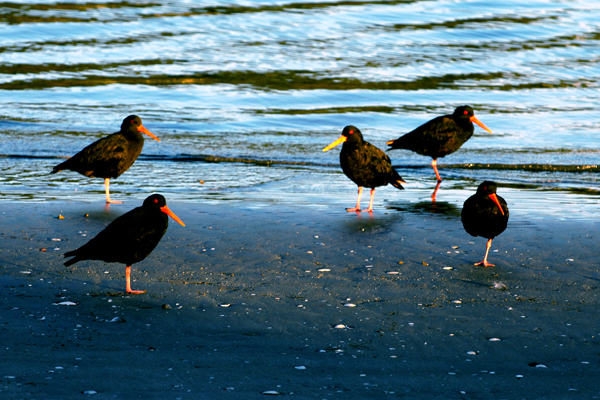 However you think, marketing measurement has benefits for you! Early in my career, I worked for a guy who believed that one of the biggest problems facing the country was an epidemic of short-term thinking. At the time, given my youth and inexperience, I didn’t give this epidemic of his a lot of thought. Over the years, though, I’ve come to realize that he was onto something. Politicians who seem primarily motivated by getting elected or re-elected, rather than by doing the right thing in the long run for the citizens whose interests they supposedly represent. General managers of professional sports teams who trade away young talent for veteran players. They sometimes make the playoffs and a little extra money for their owners, but rarely do they go on to build championship teams without investing in the long-term development of their young players. Business executives might want to invest in the future but will tend to favour taking actions that contribute to meeting shorter term objectives. Missing those objectives can disappoint financial markets and can cost those executives their bonuses and maybe their jobs. Short-term thinking can also cause companies to be reluctant to make marketing measurement a priority. It can be difficult to allocate scarce marketing resources towards something they perceive as having a longer-term payback. The pressure to think and behave that way is real, but the perception that marketing measurement’s benefits are exclusively long-term isn’t quite right. The long-term benefits from measurement are significant, but there are also important short-term benefits. Let’s look at both. Better Decisions, Better Results: This is the main and most obvious reason to measure marketing. What you learn will make your marketing more effective. Optimize Spending, Reduce Waste: Measurement helps you to learn which marketing programs are the most and least effective, so you can do more of what works and less of what doesn’t. Organize the Chaos: We live in very data rich times. As technology evolves and as the ways marketers interact with customers become more diverse, you’ll have even more data and it will be harder to make sense of it all. A good measurement system will keep your data from becoming a chaotic mess and will support making the decisions you need to make. Clear and Measurable Objectives: To commit to measurement, you must also commit to setting objectives for your programs. Proper objectives clearly define success and set expectations. This makes it easier for organizations to initially determine which activities to fund and afterwards, to measure whether they met expectations. More Scrutiny = Better Marketing: Having to define success and set objectives will require that you examine why you want to do each program before you commit budget to them, and that scrutiny will help prevent bad programs from seeing the light of day. By merely planning to measure, the cream will already start to rise to the top. Get on the Same Page: To do measurement well, you have to involve people from key functional areas of your business in the development and implementation of your process. The discussions you’ll have will help get everyone on the same page about the intent of your marketing programs and the impact across the organization of the resulting customer behaviour. Understand the Drivers of Value: Marketing’s purpose is to incent customer behaviour that creates the most value for the organization. Measurement helps you to learn how various types of customer behaviour either create or erode value across your business. That understanding also helps to ensure alignment between your marketing and corporate objectives. We may well live in a world plagued by an epidemic of short-term thinking, but that statement is probably a bit too dramatic, and anyway it’s always best to focus on what you can control. If it’s short term benefits you need, then marketing measurement will deliver. As a great bonus, you will simultaneously be investing in your long-term marketing effectiveness. Those long-term investments will also help you to meet future short-term objectives. The long and short of it is that measurement will improve your marketing effectiveness, today and in the future. If you’re not already measuring, what’s stopping you?